Where we lived: 114 West Lee Street. | Scuffalong: Genealogy. Where we lived: 114 West Lee Street. – Scuffalong: Genealogy. Where we lived: 114 West Lee Street. Me: Well, what about where, up, like, Lee Street. There were some black people that lived up that way. Me: On the other side of the tracks. Lee Street. My father: I don’t know. Me: Uh-huh. That’s where your grandparents lived. That’s where their house was. Me: If you take that street, and you cross over the track, and you go left, and then you can — you know how it kind of splits or something? Him: Yeah. Wont no black folk in there. Me: That’s where the Taylors lived. There was a little section. Him: Oh, that was when — you talking ‘bout way back in the day. Back in the day, indeed. On 11 February 1896, for $550, George D. Green and his wife Ella sold Mike Taylor a lot in the town of Wilson. Situated on a corner, the parcel fronted 143 feet on Pine Street and 83 feet on Lee. In the 1900 census of the town of Wilson, Wilson County, neither streets nor house numbers are listed, but it’s reasonable to assume that the Taylors — Mike, a drayman; his wife Rachel, who did washing; and their children “Rodgrick,” Maggie, Mattie, Maddie, Bertha E., and Hennie G. — were living there, and the 1908-1909 Wilson city directory lists Taylor, a driver, at 114 West Lee. The 1910 census of Wilson paints a clearer picture of the little enclave in which the Taylors lived. Though he did not note house numbers, the censustaker inked “Lee St” along the edge of Sheet 27A of his survey of Enumeration District 116. The page records 50 residents, of whom 30, living in five consecutive households, were black. With the Taylors were the families of Jim and Annie Parrott, John and Cora Norfleet, John and Pattie Lassiter, Sam and Maggie “Ennicks” [Ennis], and Frank and Lizzie Bullock. The men worked a variety of jobs: a blacksmith, two odd jobs laborers, a gardener, a drayman. The women were cooks or laundresses. The censustaker’s path is not clear. The Taylors were on the corner at 114 West Lee. According to the 1908-09 directory, the Bullocks were in the next block at 202 West Lee. The Ennises — Maggie was Mike and Rachel’s daughter — lived in the small house built on the back of the Taylor lot at 409 North Pine. In the 1912-13 city directory, Pattie Lassiter is listed at 200 West Lee, but John Norfleet was at 306 E. Barnes, on the other side of downtown. The Parrotts are found in neither directory. In any case, it is clear that these families formed a tiny cluster, and this cluster was unique in its surroundings. On the enumeration sheets before and after that listing the Taylors and their neighbors, the residents are overwhelmingly white. For most of the 20th century, Wilson maintained a well-defined residential segregation pattern, with black neighborhoods confined to the east side of the Atlantic Coast Line (later Seaboard Coast Line, now CSX) railroad. Daniel Hill, a mile or so west of downtown, was the notable exception. For first quarter of the century, however, African-Americans claimed another tiny toehold, now forgotten, just west of the tracks at Pine and Lee. Sanborn map of Wilson NC, September 1913. The 1913 Sanborn map, the earliest detailing the neighborhood, reveals a relatively large one-story frame house with an L-shaped porch wrapping around its west front corner. 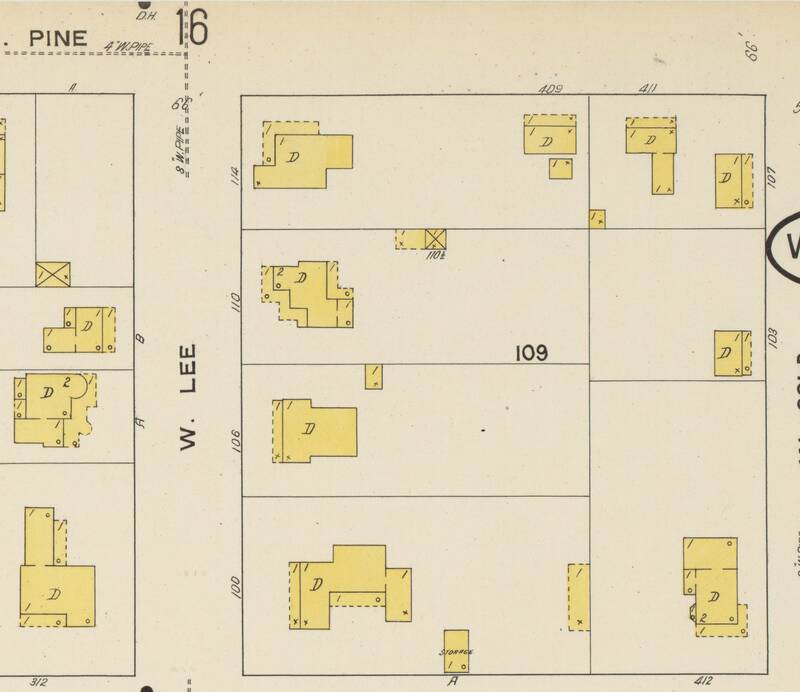 By time the 1922 Sanborn map was drawn, the city’s street numbering system had changed, and the address was now 108 West Lee. The Taylors had also added a small porch to the back of the house. Rachel and Mike Taylor remained at 108 West Lee until their deaths in 1925 and 1927. The address is now a vacant lot. → The right to vote? Pingback: Where we worked: cafes, restaurants & eating houses. | Scuffalong: Genealogy. Pingback: My Barneses. | Scuffalong: Genealogy. Pingback: Eureka! … Not. | Scuffalong: Genealogy. Pingback: Blog blessings. | Scuffalong: Genealogy.